The claim by India’s second largest two-wheeler maker Bajaj Auto Ltd that its Akurdi plant is not being shut down and that 1,310 staff, including managerial ones, and more than 840 workmen are reporting for work, is misleading, say workers who have been sent home. That’s because the firm hasn’t said what will happen to the 1,600 blue-collar workers who were previously asked to stop coming into work and who lodged a protest with the government, they say. Bajaj’s statement comes after the state government and local member of Parliament and Union minister Sharad Pawar strongly criticized the company’s decision to shut down the unit, which employs more than 2,700 blue-collar workers, including those who have been asked to stay away. Workers who have been affected by the shutdown of some parts of the production accused managing director Rajiv Bajaj of deliberately misleading the public by issuing statements that may indicate there is a change in status. Vishwa Kalyan Sanghatana (the union which has support of the majority of workers in the plant) president Dilip Pawar said the 847 workers which Bajaj has referred to are those engaged in non-production jobs such as spares, tooling, research & development, logistics and material handling, who were anyway not made redundant from their duties. The 1,310 staff comprise managers including Bajaj, other R&D personnel and office staff, he said. 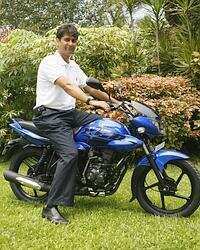 Bajaj Auto vice-president, corporate, C.P. Tripathi confirmed those numbers and the roles of the staff. He said 847 blue-collar workers had work but declined to comment on the remainder. Production at some parts of the plant was shut down by the management on September 1. In sharp contrast to Rajiv Bajaj’s public questioning of the viability of keeping the Akurdi plant operational at the company’s annual general meeting, the company’s statement on Monday said it has no grievance with its workmen and that it acknowledges their high standards of quality, productivity, and discipline. Bajaj said the management has immediately agreed to pay all workmen their full wages for six days a week, instead of five-and-a-half days per week and said it would continue to be in dialogue with its unions to ensure the legitimate interests of the workmen are taken care of. Interestingly, Dilip Pawar said some 150 workers among those told to sit at home and collect their salary since Monday last, were summoned by the management on Sunday through letters and telephone calls and told to report for temporary work on parts for the company’s Pulsar model. “They have been clearly told that this work is of a temporary nature," he said.